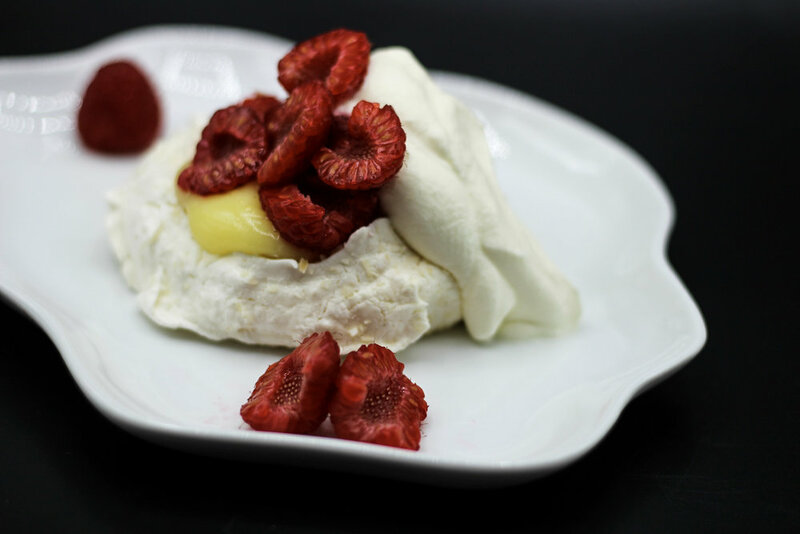 Sweet, crunchy meringue topped with creamy lemon curd and fresh raspberries. The perfect Valentines Day dessert for anyone looking for a lighter, chocolate free option. Leftover lemon curd will hold for a week in the refrigerator. It's so good, it probably won't last that long! Whip egg whites in a mixer, when frothy, slowly add the granulated sugar. Whip until medium-firm peaks. Fold in the powdered sugar and coconut until combined, being careful not to deflate the meringue. Drop in large spoonfuls onto a parchment lined sheet pan, sprinkle with extra coconut if desired. Bake at 200 degrees for 2-3 hours or until fully dry. Store meringues in an air tight container at room temperature until ready to use. Whisk all ingredients together in a metal bowl and place over a double boiler. Cook curd until it thickens and is the consistency of hollandaise sauce. Strain through a fine mesh strainer and cool over ice until ready to use. Place about 2 tablespoons of curd onto each meringue, top with halved raspberries and whipped cream. Serve immediately.